The phrase kati kati (pronounced Kah-tee Kah-tee) means “between” or “in the middle” in Swahili. 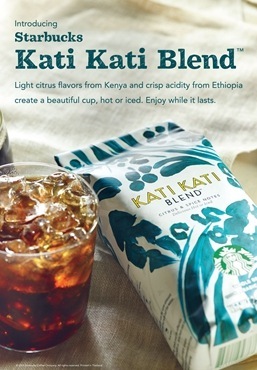 It’s an appropriate name for this blend of East African coffees with its invigorating balance of citrus and spice notes. Bright, medium-bodied and equally delightful hot or iced, this coffee pairs flawlessly with a bowl of fresh citrus fruit and your favorite sunny spot. With their juicy, tangy flavors, beans from East Africa produce extraordinary summertime coffees. Here we have beans from Kenya providing citrus and spice notes, expertly blended with beans from Ethiopia lending floral aromas and crisp acidity.